Stay here once and you’ll never want to stay anywhere else! This cozy, comfy condo in awesome Winter Park, Colorado has amenities and a central location you just can’t beat. • Free Skier Shuttle Bus Stop to the Resort: a block away at Hide-Away Park. • Across Street from Hideaway Park: faces the new stage built in 2017, free Sledding Hill Playground, Climbing Wall and Skateboard Park. Watch your kids from the patio, even holler at them to come home for dinner. • Common area/Club House: outdoor geo-thermal heated hot tub and pool, fitness center, pool table, large flat screen HDTV, common kitchen/great room and open outdoor patio with fire pit and BBQ grills. • Natural gas fireplace in the living room, In-floor radiant heat, 2 Showers and Baths, washer/dryer. • Big HDTV Smart TV in great room with surround sound and an iPod dock, TVs in both bedrooms, Comcast cable and Internet with free WIFI. • Sleeps 6-8 comfortably. High quality, plush mattresses and linens in all bedrooms for your sleeping comfort. Shampoo/Conditioner/Soap/Blow Dryer/Kitchen Necessities provided. • No Smoking or Pets. ABOUT THE OWNER: My husband and I are both in the telecommunications industry and we have two beautiful daughters, who love soccer, animals and sleep-overs. We live in Littleton, Colorado and love to ski, hike, bike, snow mobile, camp, vacation and party with friends. My husband is a third-generation native Coloradan and graduate of Colorado State University. I'm a native Californian, a graduate of University of Denver, who could just never bring myself to leave this beautiful state. FROM THE OWNER: When we first started out together in the early 1990's, we worked on the Ski Train to Winter Park for three years. The laid back pace of Winter Park,all the activities it offers and the beauty of the Fraser Valley was right up our alley. One day on the lift, I said, 'Wouldn't it be cool to have a condo up here some day?' Little did I know it, but my husband started a savings account right after that and surprised me with it one day after hearing about the opportunity with Trailhead Lodges. Thirteen years later, we were able to realize our dream with the coziest condo I could ever could have dreamed up. There's still something simply good about hard work and the pursuit of happiness. FROM THE OWNER: While it has all the comforts of a good vacation property, like a pool and hot tub, HDTV with surround sound, an iPod dock,washer and dryer in the unit and an open floor plan, it comes down to the old adage: location, location, location. Our condo is on the ground floor with a sliding glass door that opens to a little grassy (or snowy!) yard and wrap-around porch with a swing that looks right out at Hide Away Park. In the winter, there's a sledding hill a stone's throw away and the whole park is lit up in holiday lights at night. Plus, the bus stop that takes you to Winter Park Village is directly across the street. In the summer, the playground and skateboard park give it a fun playful atmosphere and a terrific venue for great concerts on select weekends. That coupled with great restaurants, shopping and the bike or walking path a block or two away in the heart of Winter Park makes this the ideal getaway for our family and friends, as well as yours. Welcome to the mountains! Very close to a real "Home" away from home! We were very satisfied with the layout, furnishings and condition of the condo. It was obviously well taken care of and we tried to keep it that way. We appreciated not only the convenience of the washer and dryer but also the cleaning supplies as well the variety and convenient sizes of of other cleaning supplies and the condiments and kitchen items that were very useful. As an 82-year old who is not as nimble as I once was, I would suggest that, for greater convenience and security, you consider adding grab bars to the showers. Thanks for care. The condo is super nice and very comfortable and roomy! The kitchen had everything you would need to cook for a large group all week (griddle, blender, toaster, crock pot, plenty of utensils and other equipment). The second bedroom with the bunks was awesome and provided a ton of room and sleeping. The floor plan is great too, with the 2nd bathroom directly across the hall from the 2nd bedroom. The laundry in the unit was perfect to dry out wet ski clothes. On the downside the complex and facilities were not so great. The walks and parking lot were not cleared. Each day I had to walk in ankle to knee deep snow to get to my car. There was a significant snow fall while were stayed and only 1 time did i see the parking area get partially cleared. The sidewalk never got cleared although they did provide a shovel and bucket of sand. At over $320/night I would expect better. I have been staying in WP for over 40 years and I have never seen anything this bad. I appreciate the mountains and love the snow but when you pay good money to stay at a complex I expect these things to be taken care of. I would stay in the condo again in a second but will think twice simply because of the poor facility up keep. The snow removal issue is being addressed. Many homeowners in the downtown area were concerned with snow removal during the week this guest stayed in the unit. Winter Park was very fortunate to receive A TON of snow during spring break and it was difficult for the town and for complexes to keep up with it. The Trailhead Complex in particular is taking this issue very seriously. 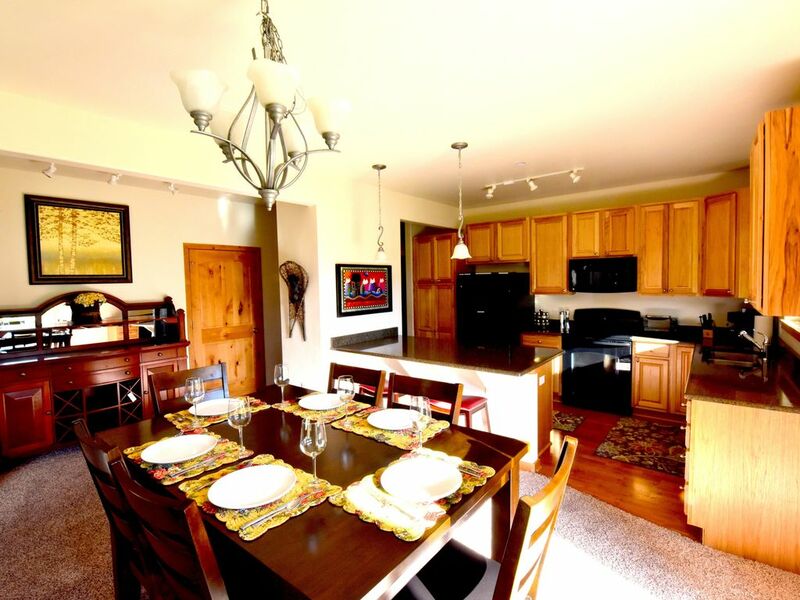 This condo was in a great location, easily accessible to restaurants, bars and the slopes. The condo was clean, functional and plenty of room for the 4 adults we had there. We would definitely come back! Thanks for a great stay! Place was as described and very clean and comfortable! Very convenient to downtown Winter Park. Our second time and would return. Dog Sled Rides, Sleigh Rides and much, much more! One night stays are only CONSIDERED. ALSO, SPECIAL FESTIVAL RATES APPLY AND CAN CHANGE WITHOUT NOTICE.